This thread was archived on 8 March 2016 by Liquidhelium. I don't know if this will be the same in the live game, but we should decide now whether or not to use textures. I think the answer is obvious: If Cook Me Plox can automate textures, use textures; otherwise, use whatever he can automate. 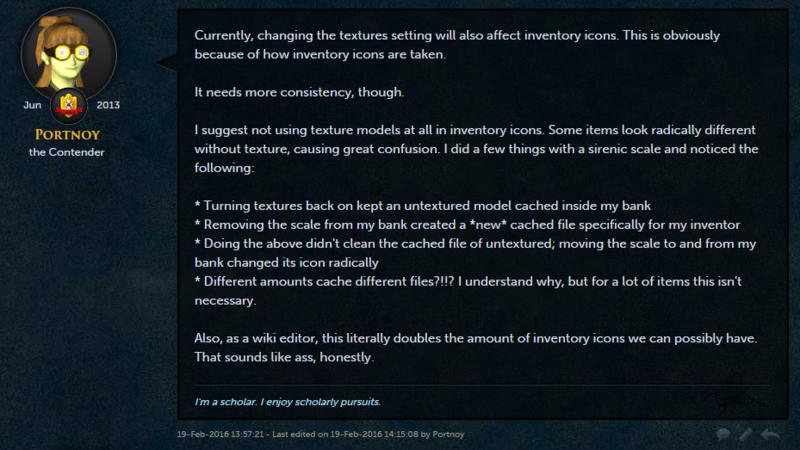 Also, general NXT issues-that-affect-the-wiki thread. Inventory icons aside, should we begin retaking other types of images (e.g. equipped images, area images)? Should we wait until NXT is actually released or begin retaking images while it is still in beta? If we retake images before NXT release should we start straight away or wait for later beta weekends? What needs to be retaken: should we retake everything or only things that look different from how they are in the existing client? This page was last modified on 13 June 2018, at 13:41.